Dr Leonard Tijing is a Senior Lecturer at the University of Technology Sydney (UTS). He received his bachelor’s degree from Silliman University, Philippines and obtained both Masters and Ph.D. degrees from Chonbuk National University, South Korea. His research interests include membrane development and process optimization for desalination and water purification technologies. He has published nearly 100 refereed journal articles so far (h-index = 27) and is a peer reviewer of more than 20 international journal publications. He is currently co-/supervising 3 PhD students. 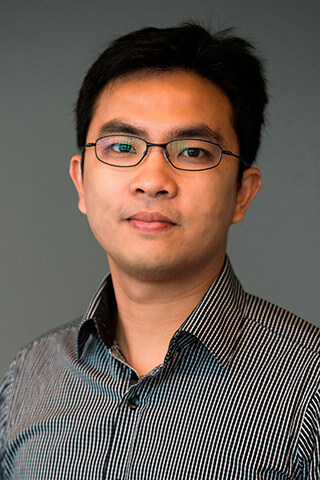 He is the postgraduate course coordinator as well as the Research degree coordinator for environmental engineering and was the past coordinator of the monthly Environmental Engineering Research Seminar Series at UTS. He currently serves as a board of director of the Membrane Society of Australasia. The effects of bioreactor temperatures and salinities of an anaerobic membrane distillation bioreactor (anMDBR) on the permeation performance and their potential recovery of bioresources were fully examined in this study. To the best of our knowledge, this is the first study of a lab-scale anMDBR process utilizing sub-merged hollow fiber membranes. The hybrid system utilizing both membrane distillation (MD) and anaerobic bioreactors achieved 99.99% inorganic salt rejection regardless the operation temperatures and high initial flux from (2-4Lm-2 h-1) at 45-65°C. However, after 7-day operation, the flux dropped by 16-50% proportional to the bioreactor temperatures. It was found that the effects of bioreactor temperatures had strong impacts on both the permeation performance and fouling behavior while salinity had insignificant effect. A compact non-porous fouling layer was observed on the membrane surface from the bioreactor operated at 65°C while only a few depositions was found on the membrane from 45°C bioreactor. In the present study, the optimal anMDBR temperature was found to be 45°C, showing a balanced biogas production and membrane permeation performance including less fouling formation. At this bioreactor temperature (45°C), the biogas yield was 0.14L/g CODremoval, while maintaining a methane recovery of 42% in the biogas, similar recovery to those at bioreactor temperatures of 55 and 65°C. The potential recovery of volatile fatty acids made anMDBR a more economically efficient system, in addition to its lower operation cost and smaller footprint compared with most other technologies for on-site wastewater treatment. © 2017 Elsevier B.V. Membrane distillation (MD) has great potentials to treat produced water in energy industries. However, volatile organic compounds (VOCs) existing in the produced water added in the fracking process can hinder the treatment process regarding two aspects: permeate quality and MD flux performance. To address this challenge, this study aims to systematically study the effects of the VOCs on the MD permeation performance and permeate quality, and the mechanism of its penetration. Acetic acid, ethylene glycol, isopropyl alcohol (IPA), and 2-Butoxyethanol (2-BE), which are commonly found in the produced water, were extensively investigated and their impacts were reviewed and compared. Among all the VOCs, 2-BE had the highest mass transfer despite its low vapour pressure and large molecule weight. Some of the VOCs had surfactant properties, which meant they could penetrate the membrane pores easily during MD process. In long-term operation, pore wetting started to appear as the salt rejection was dropping in the MD process, and flux was also decreasing. Based on the results, this study suggested that the strength of surfactant properties and intra-molecular hydrogen bonds between water molecules and VOCs are as significant as vapour pressure for the VOCs in terms of mass transfer efficiency in MD system. © 2018 by the authors. Licensee MDPI, Basel, Switzerland. Electrospun nanofiber-supported thin film composite membranes are among the most promising membranes for seawater desalination via forward osmosis. In this study, a high-performance electrospun polyvinylidenefluoride (PVDF) nanofiber-supported thin film composite (TFC) membrane was successfully fabricated after molecular layer-by-layer polyelectrolyte deposition. Negatively-charged electrospun polyacrylic acid (PAA) nanofibers were deposited on electrospun PVDF nanofibers to form a support layer consisted of PVDF and PAA nanofibers. This resulted to a more hydrophilic support compared to the plain PVDF nanofiber support. The PVDF-PAA nanofiber support then underwent a layer-by-layer deposition of polyethylenimine (PEI) and PAA to form a polyelectrolyte layer on the nanofiber surface prior to interfacial polymerization, which forms the selective polyamide layer of TFC membranes. The resultant PVDF-LbL TFC membrane exhibited enhanced hydrophilicity and porosity, without sacrificing mechanical strength. As a result, it showed high pure water permeability and low structural parameter values of 4.12 L m2 h1 bar1 and 221 µm, respectively, significantly better compared to commercial FO membrane. Layer-by-layer deposition of polyelectrolyte is therefore a useful and practical modification method for fabrication of high performance nanofiber-supported TFC membrane. © 2016 Elsevier B.V.The water flux in forward osmosis (FO) process declines substantially when the draw solution (DS) concentration reaches closer to the point of osmotic equilibrium with the feed solution (FS). Using external hydraulic pressure alongside the osmotic driving force in the pressure assisted osmosis (PAO) has been found effective in terms of enhancing water flux and even potentially diluting the DS beyond osmotic equilibrium. The net gain in water flux due to the applied pressure in the PAO process closely depends on the permeability of the FO membrane. The commercial flat sheet cellulose triacetate (CTA) FO membrane has low water permeability and hence the effective gain in water flux in the PAO process is low. In this study, a high performance thin film composite membrane was developed especially for the PAO process through casting polyethersulfone (PES) polymer solution on a compacted woven fabric mesh support followed by interfacial polymerisation for polyamide active layer. This PAO membrane possesses a water flux of 37Lm2 h-1 using 0.5M NaCl as DS and deionised water as the feed at an applied hydraulic pressure of 10bar. Besides, the membrane was able to endure the external hydraulic pressure required for the PAO process owing to the embedded backing fabric support. While the membranes with low structural parameters are essential for higher water flux, this study shows that for PAO process, polymeric membranes with larger structural parameters may not be suitable for PAO. They generally resulted in compaction and poor mechanical strength to withstand hydraulic pressure. © 2016 Elsevier Ltd A novel thin-film composite (TFC) forward osmosis (FO) membrane with dual-layered substrate membrane was fabricated by a double-blade casting technique using different polysulfone (PSf) concentrations for top (15 wt%) and bottom (7 wt%) substrate layers. Graphene oxide (GO) was incorporated in the substrate layer, and the dual casting approach resulted in a membrane support with a highly porous bottom structure and a dense top skin layer on which the polyamide active layer was effectively formed. The dual-layered TFC PSf/GO membrane (TFC-PSf d GO) exhibited high water permeability, and ion selectivity was enhanced by the presence of well dispersed hydrophilic GO in the PSf substrate. The TFC-PSf d GO also exhibited the lowest specific reverse salt flux (J s /J v = 0.19 g L -1 ) and a more favorable structural parameter (S = 130 m) compared to GO-free membranes. Using deionized water as feed solution and 1 M NaCl as draw solution (DS), TFC-PSf d GO had J v = 33.8 L m 2 h 1 and J s = 6.9 g 2 h 1 under AL-FS mode, and J v = 61.5 L m 2 h 1 and J s = 14.0 g 2 h 1 under AL-DS mode. The potential of TFC-PSf d GO for commercial application was further evaluated by fabricating it with a fabric backing support (denoted as TFC-PSf d GO f ). Compared to TFC-PSf d GO, TFC-PSf d GO f exhibited only 14% decline in its water flux. The overall results reveal that, fabrication of TFC substrate membrane via dual-blade casting approach along with GO incorporation produced high-performance TFC FO membranes which likely reduced the internal concentration polarization effects. © 2017 by the authors. Electrospun membranes are gaining interest for use in membrane distillation (MD) dueto their high porosity and interconnected pore structure however, they are still susceptible towetting during MD operation because of their relatively low liquid entry pressure (LEP). In thisstudy, post-treatment had been applied to improve the LEP, as well as its permeation and saltrejection efficiency. The post-treatment included two continuous procedures: heat-pressing andannealing. In this study, annealing was applied on the membranes that had been heat-pressed.It was found that annealing improved the MD performance as the average flux reached 35 L/m 2 hor LMH ( > 10% improvement of the ones without annealing) while still maintaining 99.99% saltrejection. Further tests on LEP, contact angle, and pore size distribution explain the improvementdue to annealing well. Fourier transform infrared spectroscopy and X-ray diffraction analysesof the membranes showed that there was an increase in the crystallinity of the polyvinylidenefluoride-co-hexafluoropropylene (PVDF-HFP) membrane also, peaks indicating the phase ofpolyvinylidene fluoride (PVDF) became noticeable after annealing, indicating some and amorphousstates of polymer were converted into the phase. The changes were favorable for membranedistillation as the non-polar phase of PVDF reduces the dipolar attraction force between themembrane and water molecules, and the increase in crystallinity would result in higher thermalstability. The present results indicate the positive effect of the heat-press followed by an annealingpost-treatment on the membrane characteristics and MD performance. This study describes the development and performance of an omniphobic poly(vinylidene fluoride) (PVDF) membrane by electrospinning and CF 4 plasma surface modification for air gap membrane distillation (AGMD). The effect of different duration of plasma treatment on the nanofiber membrane cha racteristics was investigated. The AGMD performance of the membranes was evaluated using real reverse osmosis (RO) brine produced from coal seam gas (CSG) water that was added with low surface tension liquid (surfactant) as feed solution. Results indicated the formation of new CF 2 -CF 2 and CF 3 bonds after plasma treatment, which lowered the surface energy of the membrane, providing omniphobic property, as indicated by its wetting resistance to different low surface tension liquids such as methanol, mineral oil and ethylene glycol. Though no appreciative changes in morphology of the membrane were observed after plasma treatment, optimal treatment condition of 15 min (i.e., P/CF-15 membrane) exhibited lotus effect membrane surface with increased liquid entry pressure of 187 kPa compared to 142 kPa for neat membrane. AGMD performance showed stable normalized flux (initial flux of 15.3 L/m 2 h) and rejection ratio (100%) for P/CF-15 even with the addition of up to 0.7 mM sodium dodecyl sulfate surfactant to the RO brine from CSG produced water feed, while commercial PVDF membrane suffered membrane wetting after 0.3 mM of surfactant addition. Based on the results, the present omniphobic membrane has good potential for producing clean water from challenging waters containing high salinity and organic contaminants. © 2017 Institution of Chemical Engineers A new approach that combines nanoscale zero-valent iron (nZVI) with electrospinning technology has been put forward to avoid nZVI agglomeration and a secondary pollution. In this study, to enhance the immobilization of nZVI particles onto the polyacrylic acid (PAA)/polyvinyl alcohol (PVA) electrospun nanofiber mat, mats (M1, M2 and M3) with different PAA/PVA mass ratios (1:1, 2:1 and 3:1) were tested for the immobilization of nZVI particles and their performance of removing contaminants. The results indicate that M3 immobilized the most nZVI particles (48.4 wt% on the mat, 2.5 times the figure for previous study) and had the highest removals to methylene blue and Cu(II) ions at 94% and 83.6% respectively, resulting from more free carboxylic groups available on the cross-linked nanofibers as well as a higher porosity into the mat. Therefore, increasing the PAA/PVA ratio is effective to boost the performance of nZVI–PAA/PVA electrospun nanofiber mat, which has a great potential for the application of nZVI-targeted contaminants remediation. © 2017 Elsevier B.V. In this study, we first revealed a 'robbing behavior' during the immobilization of nZVI particles onto an electrospun polyacrylic acid (PAA)-polyvinyl alcohol (PVA) nanofiber mat. The robbing behavior can significantly reduce the number of nZVI particles immobilized onto the mat and hence weaken the performance of mitigating contaminated water. To minimize the undesirable effect of robbing behavior, we developed a dipping method that enables exposure of enough free Fe (II) as electron acceptors to the Fe (II)-complexed PAA-PVA mat for the subsequent reduction. The result indicates that the mat with dipping can immobilize more than 1.7 times the weight percentage of nZVI particles for the mat without dipping. Moreover, the dipping method can also re-immobilize or enrich nZVI particles on the mat that has already partially immobilized nZVI particles. The nZVI-immobilized mat dipped once into the FeSO4 solution with a very little concentration (0.32 g/L) had an excellent performance for trichloroethylene (TCE) degradation (more than 92% TCE removed). Here, the developed dipping method shows great potential for nZVI immobilization and groundwater remediation. Nanoscale zero-valent iron (nZVI) has been widely used for the reduction of halogenated organics and heavy metals in the groundwater. However, individual nZVI particles are mobile and prone to aggregate, thereby reducing the reaction sites exposed to contaminants. Electrospun polymer nanofiber mat is an ideal carrier to immobilize and distribute nZVI particles after its merits of high specific area, size-controllable and material-compatible properties. In this study, nZVI particles were loaded onto the polyacrylic acid (PAA)-polyvinyl alcohol (PVA) electrospun nanofiber mats with different PAA/PVA ratios. The results indicate that mat with the PAA/PVA ratio of 3:1 loaded the most nZVI particles (48 wt%) and had the highest removals to methylene blue at 94% and Cu (II) ions at 84% respectively. The nZVI-loaded electrospun nanofiber mat has promising application for the groundwater contaminants mitigation. © 2015 Elsevier B.V. In the present study, dual-layer nanofiber nonwoven membranes were prepared by a facile electrospinning technique and applied for desalination by air gap membrane distillation (AGMD). Neat single and dual-layer nanofiber membranes composed of a hydrophobic polyvinylidene fluoride-co-hexafluoropropylene (PH) top layer with different supporting hydrophilic layer made of either polyvinyl alcohol (PVA), nylon-6 (N6), or polyacrylonitrile (PAN) nanofibers were fabricated with and without heat-press post-treatment. Surface characterization showed that the active layer (i.e., PH) of all electrospun nanofiber membranes (ENMs) exhibited a rough, highly porous (>80% porosity), and hydrophobic surface (CA>140°), while the other side was hydrophilic (CA<90°) with varying porosity. Heat-pressing the membrane resulted to thinner thickness (from >129m to <100m) and smaller pore sizes (<0.27m). The AGMD experiments in a co-current flow set-up were carried out with constant inlet temperatures at the feed and permeate streams of 60±1.5 and 20±1.5°C, respectively. The AGMD module had a membrane area of 21cm2 and the thickness of the air gap was 3mm. The neat single and dual-layer ENMs showed a water permeate flux of about 10.9-15.5L/m2 h (LMH) using 3.5wt.% NaCl solution as feed, which was much higher than that of a commercial PVDF membrane (~5LMH). The provision of a hydrophilic layer at the bottom layer enhanced the AGMD performance depending on the wettability and characteristics of the support layer. The PH/N6 dual-layer nanofiber membrane prepared under the optimum condition showed flux and salt rejection of 15.5LMH and 99.2%, respectively, which has good potential for AGMD application. Membrane distillation (MD) is considered as a promising next-generation technology for desalination. However, there is no specific membrane designed and engineered for this application yet. Recently, electrospun polymeric membranes have been widely investigated due to their relatively high porosity, high hydrophobicity and controllable pore size. However, the robustness of such membranes is not guaranteed as they are susceptible to wetting in long-term operation. Heat-press treatment is a simple and effective procedure to improve both morphological and mechanical characteristics of the electrospun membrane. Nevertheless, the heat-press technique is not fully investigated although some conditions are applied to the electrospun membrane in previous researches. In this paper, a comprehensive investigation of the effect of heat-press temperature, pressure and duration on the morphological and mechanical characteristics of electrospun membrane is accomplished. Impressive improvement of mechanical strength and liquid entry pressure (LEP) can be achieved after heat-press treatment on the electrospun membranes. It is also found that temperature and duration play more important roles than pressure in heat-press treatment. In addition, it is ascertained that optimal treatment conditions for heat-press includes temperature at 150 °C, pressure at 6.5 kPa, and duration for 8 h for the present electrospun polyvinylidene fluoride-co-hexafluoropropylene membrane. A decent DCMD permeation flux of 29 LMH and salt rejection of 99.99% can be achieved with the optimally heat-pressed electrospun membranes for desalination at feed and permeate temperatures of 60 and 20 °C, respectively. from 10 to 20 nanometres. The preparation and performances of the newly synthesized thin film composite (TFC) forward osmosis (FO) membranes with graphene oxide (GO)-modified support layer are presented in this study. GO nanosheets were incorporated in the polysulfone (PSf) to obtain PSf/GO composite membrane support layer. Polyamide (PA) active layer was subsequently formed on the PSf/GO by interfacial polymerization to obtain the TFC-FO membranes. Results reveal that at an optimal amount of GO addition (0.25 wt%), a PSf/GO composite support layer with favorable structural property measured in terms of thickness, porosity and pore size can be achieved. The optimum incorporation of GO in the PSF support layer not only significantly improved water permeability but also allowed effective PA layer formation, in comparison to that of pure PSf support layer which had much lower water permeability. Thus, a TFC-FO membrane with high water flux (19.77 Lm-2h-1 against 6.08 Lm-2h-1 for pure PSf) and reverse flux selectivity (5.75 Lg-1 against 3.36 Lg-1 for pure PSf) was obtained under the active layer facing the feed solution or AL-FS membrane orientation. Besides the improved structural properties (reduced structural parameter, S) of the support layer, enhanced support hydrophilicity also contributed to the improved water permeability of the membrane. Beyond a certain point of GO addition (0.5 wt%), the poor dispersion of GO in dope solution and significant structure change resulted in lower water permeation and weaker mechanical properties in support as well as FO flux/selectivity of consequent TFC membrane. Overall, this study suggests that GO modification of membrane supports could be a promising technique to improve the performances of TFC-FO membranes. Titanium dioxide is an effective photocatalyst for the breakdown of many environmental contaminants. The complex mixtures that can occur in water matrices can significantly affect the breakdown of the contaminants in water by titanium dioxide (TiO2). The authors discuss a wide variety of foulants and inhibitors of photocatalytic TiO2 systems and review different methods that can be effective for their fouling prevention. Approaches to regenerate a fouled or contaminated TiO2 catalysts are explored and the effect of substrates on immobilized titanium dioxide is also reviewed. In the past few years, silica-modified titania has drawn increasing attention due to their special properties making them ideal candidates for a wide range of applications. In this study, we report a novel method for the synthesis of silica-modified titania by a sol–gel method using sodium silicate solution (1 M). The hydrolysis and condensation reactions of titanium dioxide (TiO2, Degussa Aeroxide® P25) in sodium silicate solution proceeded with citric acid (3 M) as a catalyst. The orbital shaking method was followed for the removal of sodium salt formed during the sol–gel process. Solvent exchange was carried out using methanol and hexane. Finally, chemical modification of the gel was conducted using trimethylchlorosilane followed by ambient pressure drying. The obtained silica-modified titania was characterised for nanostructural analysis using scanning electron microscopy and transmission electron microscopy. The nitrogen adsorption–desorption measurements were employed to investigate the BET surface area, pore structure and pore volume of specimens. Thermal gravimetric analysis showed exothermic peaks at temperature range of 90–190 °C representing the oxidation of organic groups from –Si–R network. The silica-modified titania showed high photocatalytic activity and an easy recovery using crystal violet as model water pollutant. Park, C., Kim, E.K., Tijing, L.D., Amarjargal, A., Pant, H.R., Kim, C.S. & Shon, H.K. 2014, 'Preparation and characterization of LA/PCL composite fibers containing beta tricalcium phosphate (-TCP) particles', Ceramics International, vol. 40, no. 3, pp. 5049-5054. This study investigated the influence of electrospun polyurethane mats containing different contents of carbon nanotubes (CNTs) stacked in between basalt fabric layers to form a composite laminate. The composite laminate was fabricated using a vacuum-assisted resin transfer molding (VARTM) process. Flexural test were carried out to investigate the strength and stiffness of composites for each configuration, while the failure characteristics were observed using a field emission scanning electron microscopy (FESEM) analysis. The results showed that flexural strength and stiffness of the hybrid composites with increasing CNT content in polyurethane (PU) nanofiber were increased by 6.5% and 17.3%, respectively. Furthermore, the addition of surfactants for the dispersion of CNTs in nanofibers significantly improved the flexural property of the composite interply basalt fabric-CNT/PU laminates. This study proved that the use of multi-scale reinforcement fillers with good and homogeneous dispersion increased the mechanical performance of the composite. Rapid population growth has resulted in imbalance in the supply and demand of fresh water for human consumption. As the sources of fresh water from surface water and fresh groundwater have been consistently depleting at an alarming rate, alternative sources such as seawater and brackish water are sought out. Desalination of water is considered as one of the most sustainable and best water resource alternatives. Membrane distillation (MD) is an emerging and promising technology for water desalination and purification. It presents many advantages over the common desalination technologies such as reverse osmosis. The two major factors hindering the application of MD are suitable membrane design and structure, and energy efficiency of the MD process. In recent years, membrane design has seen increasing research and interest. Advances in science and technology have led to new materials and techniques that could find potential application for membranes in MD. In the past few years, electrospinning of nanofibers has gained much interest and attention in their application for MD membrane, and so far has promising results. This review focuses on the recent progress in the application of nanofibrous membrane fabricated by electrospinning for MD application. In this study, the effect of different tourmaline (TM) micro/nano particle loading (i.e., 0.5–2 wt%) on the tensile and flexural properties of a basalt fiber-reinforced epoxy composite laminate (BFRP) was investigated. The TM/basalt/epoxy laminates were fabricated by impregnating woven basalt fibers into epoxy resin mixed with TM particles via vacuum assisted resin transfer molding. Tensile and flexural tests were performed according to ASTM standards. Fracture surfaces were characterized by scanning electron microscopy and energy dispersive spectroscopy. The results showed significant improvement in both tensile and flexural strength and modulus when tourmaline particles where incorporated in the basalt/epoxy composite. The best result was obtained at 1 wt% TM loading with surfactant (i.e., C4) showing an increase of 16% in both tensile and flexural strength, and 27.4% and 153.3% increase in tensile and flexural modulus, respectively, compared to neat basalt/epoxy composite. The enhanced performance of TM/basalt/epoxy laminates is attributed to a good dispersion of TM particles in the epoxy matrix providing increased surface area for strong interfacial interaction and good load transfer. We investigated the effect of different stacking sequences of carbon and basalt fabrics on the flexural properties of hybrid composite laminates. The hybrid composites were fabricated using a vacuum-assisted resin transfer molding process. Three-point bending test was performed and the fracture surfaces were examined by scanning electron microscopy. The present results showed that the flexural strength and modulus of hybrid composite laminates were strongly dependent on the sequence of fiber reinforcement. All the stacking sequences showed a positive hybridization effect. The interply hybrid composite with carbon fiber at the compressive side exhibited higher flexural strength and modulus than when basalt fabric was placed at the compressive side. Here, the proper stacking sequence of basalt and carbon fiber layers was found to improve the balance of the mechanical properties of the hybrid composite laminate. Beta-TCP (-TCP) particle-containing LA/PCL micro/nanofibers were fabricated via a one-step electrospinning process. The morphology and chemical structure of the composite nanofibers were characterized by FESEM, XRD, and FTIR. Rougher surfaces were observed for the LA/PCL micro/nanofibers containing -TCP compared to the neat LA/PCL fibers, which could possibly provide extra sites for cell binding. XRD and FTIR confirmed the presence of -TCP as being firmly deposited on the fibers. After an immersion in distilled water, we observed that the -TCP-containing composite fibers were more degradable with many damaged and broken fibers compared to the LA/PCL fibers. MTT assay and immersion test showed better cell viability and proliferation, and improved mineralization ability compared to the LA/PCL only mat. Thus, the incorporation of -TCP and the presence of LA in PCL micro/nanofibers could result to an improved biocompatibility and faster degradation of the composite fibers, which would possibly be useful for tissue scaffold application. Potassium titanate nanostructures were synthesised by hydrothermal treatment of TiO2 (P25) in KOH and H2O2. As-produced powders were characterised by scanning electron microscopy, energy-dispersive X-ray spectroscopy, transmission electron microscopy, X-ray diffraction, and nitrogen adsorption-desorption methods. Longitudinally-oriented-wire-like structures with a length up to several micrometres and diameters ranging from 10 to 30 nm were obtained. Larger size fibrous nanowires resulting from the hydrothermal treatment showed high affinity in adsorbing crystal violet (CV), which was mainly due to their high surface area. The photocatalytic bleaching of CV solution revealed that the wires are photoactive under ultraviolet light irradiation. Macroporous nanowires are considered as effective adsorbents of CV, capable of photocatalytic degradation, and they can be easily separated from the solution by settling. In this study, Ag–ZnO/reduced graphene oxide (Ag–ZnO/RGO) composite was synthesized by a green and facile one-step hydrothermal process. Aqueous suspension containing Ag and ZnO precursors with graphene oxide (GO) sheets was heated at 140 °C for 2 h. The morphology and structure of as-synthesized particles were characterized by field emission scanning electron microscopy (FE-SEM), transmission electron microscopy (TEM), X-ray diffraction (XRD), Raman spectroscopy, and Photoluminescence (PL) spectroscopy which revealed the formation of composite of metal, metal oxide and RGO. It was observed that the presence of Ag precursor and GO sheets in the hydrothermal solution could sufficiently decrease the size of ZnO flowers. The hybrid nanostructure, with unique morphology, obtained from this convenient method (low temperature, less time, and less number of reagents) was found to have good photocatalytic and antibacterial activity. The perfect recovery of catalyst after reaction and its unchanged efficiency for cyclic use showed that it will be an economically and environmentally friendly photocatalyst. Laboratory corrosion immersion tests were carried out to investigate the effectiveness of a physical water treatment (PWT) using zinc and ceramic tourmaline-based catalytic materials for the control of carbon steel corrosion in acidic still water (i.e., pH 4.5–5). The tests were carried out at different water temperatures over 168 h. Our results showed a maximum of 22 % reduction in the corrosion rate using PWT in comparison with the control case. Furthermore, the corrosion products depicted more agglomerated particles after the PWT treatment. In both cases, differences were observed in the crystal structures, showing in general lower corrosion activity when PWT was used. The present results could find potential applications in water distribution systems and where metallic materials are exposed to stagnant acidic water. In this work, the reduced graphene oxide (RGO) sheets were effectively uploaded through nylon-6 fibers using combined process of electrospinning and hydrothermal treatment. Good dispersion of graphene oxide (GO) with nylon-6 solution could allow to upload GO sheets through nylon-6 fibers and facilitate the formation of spider-wave-like nano-nets during electrospinning. GO sheets present on/into nylon-6 spider-wave-like nano-nets were further reduced to RGO using hydrothermal treatment. The impregnated GO sheets into nylon-6 nanofibers and their reduction during hydrothermal treatment were confirmed by FE-SEM, TEM, FT-IR and Raman spectra. The electrical characteristics of pristine nylon-6, GO/nylon-6 and RGO/nylon-6 nanofibers were investigated and it was found that RGO/nylon-6 composite mat had better electrical conductivity than others. The formation of spider-wave-like nano-nets as well as indirect route of incorporation of RGO sheets on electrospun nylon-6 mat may open a new direction for future graphene/polymer electronics. In this study, core–shell Ag/Fe3O4 nanocomposites have been successfully prepared by modified co-precipitation route followed by facile hydrothermal treatment in one-pot synthesis under various (Ag(NH3)2+) ion concentrations without adding any reducing agents. A single crystal Ag core and polycrystallized Fe3O4 shell nanostructures could be obtained when high amount of AgNO3 precursor are used in the presence of Fe2+ ions source, i.e., ferrous salt alone. A mechanism leading to the formation of such morphologies was proposed and samples were characterized with several analytical techniques including field emission scanning electron microscopy (SEM), transmission electron microscopy (TEM), X-ray diffraction (XRD), X-ray photoelectron spectroscopy (XPS) and Fourier-transform infrared (FT-IR) spectroscopy. Significant increase of saturation magnetic moment was observed for the Ag/Fe3O4 nanocomposite. The results showed enhanced magnetic moment and strong catalytic and antibacterial activities of the present Ag/Fe3O4 nanocomposite, demonstrating its importance for potential application in water treatment and biomedical application, with the ability of subsequent removal by means of an external magnetic field. Here, we investigated the synergistic effect of fluidized ceramic tourmaline nanoparticles (NPs) with oscillating electric fields to the inactivation of Escherichia coli in batch suspension. Different amounts of tourmaline NPs (5–100 mg) were dispersed in bacterial suspension (50 ml) and oscillating radio frequency (RF) electric field was applied at 3 V (equivalent of 1.5 V/cm electric field strength) and at varying frequencies (100 kHz and 1 MHz). The results showed high inactivation efficiency when combining fluidized tourmaline NPs and oscillating electric fields as compared to individual treatments of electric fields or tourmaline NPs only. The results showed 2.5–5-log reduction of viable E. coli concentration depending on the tourmaline concentration, electric field frequency and solution temperature. The present method shows a lot of promise as a novel and low-cost bacterial inactivation technique for water treatment applications. A new route for the formation of reusable photocatalytic TiO2 (P25)-reduced graphene oxide/nylon-6 (P25-RGO/nylon-6) composite filter membrane using electrospinning and hydrothermal techniques is being reported. Addition of small amount of graphene oxide (GO) into nylon-6 solution prior to electrospinning was able to cause the formation of a large-scale uniform bimodal fibers with distributed thick (200 nm) and thin (13 nm) fiber diameters in spider-wave-like nano-nets by electrospinning, and facilitated the deposition of P25 NPs during its reduction at the time of hydrothermal treatment. Different analyses confirmed that GO was successfully incorporated into the electrospun nylon-6 fibers and simultaneous reduction of GO as well as deposition of P25 NPs on the surface of fibers was possible during hydrothermal treatment. The photoactive property of the as-prepared nanocomposites was tested against methylene blue. The results showed that P25-RGO/nylon-6 nanocomposite mat is more effective than the TiO2/nylon-6 electrospun composite mat. The water flux at a given pressure of different mats was measured to find out the filter efficiency of the membranes. The as-prepared composite mat has great potentiality as an economically–friendly water filter media and reusable photocatalyst. In this paper, a simple and efficient strategy was developed for preparing flower-shaped ZnO doped reduced graphene oxide (RGO) composite material by simultaneous crystal growth (of ZnO) and reduction (of graphene oxide) using hydrothermal process. Several analytical techniques, including scanning electron microscopy (SEM), transmission electron microscopy (TEM), X-ray diffraction (XRD), FT-IR spectroscopy, Raman spectroscopy, and photoluminescence spectroscopy have been used to characterize the resulting ZnO/RGO photocatalyst. Results showed that highly crystalline ZnO nano-flowers were effectively doped on the surface of RGO sheets. The unique properties of RGO sheets not only provide the decreased rate of electron–hole separation in ZnO but also prevent from the loss of photocatalyst during recovery due to the fixed attachment of ZnO NPs on the surface of high aspect ratio graphene sheets. Therefore, as-synthesized composite is an economically and environmentally friendly photocatalyst. Multiwalled carbon nanotube/polyurethane (MWNT/PU) composites were prepared by electrospinning and solution casting. The morphological and thermal properties, and mechanical performance of the nanofiber and film composites were characterized and compared. The tensile strength of neat PU film was 9-fold higher than that of neat PU nanofibrous mat. The incorporation of MWNTs increased the tensile strength and modulus of the composite nanofibers by 69% and 140%, respectively, and 62% and 78%, respectively for composite films. The MWNT/PU composites showed an improved thermal degradation behavior, with the incorporation of low MWNT content in the composites. A facile method of fabricating novel heat-generating membranes composed of electrospun polyurethane (PU) nanofibers decorated with superparamagnetic iron oxide nanoparticles (NPs) is reported. Electrospinning was used to produce polymeric nanofibrous matrix, whereas polyol immersion technique allowed in situ assembly of well-dispersed Fe3O4 NPs on the nanofibrous membranes without any surfactant, and without sensitizing and stabilizing reagent. The assembly phenomena can be explained by the hydrogen-bonding interactions between the amide groups in the PU matrix and the hydroxyl groups capped on the surface of the Fe3O4 NPs. The prepared nanocomposite fibers showed acceptable magnetization value of 33.12 emu/g, after measuring the magnetic hysteresis loops using SQUID. Moreover, the inductive heating property of electrospun magnetic nanofibrous membranes under an alternating current (AC) magnetic field was investigated. We observed a progressive increase in the heating rate with the increase in the amount of magnetic Fe3O4 NPs in/on the membranes. The present electrospun magnetic nanofibrous membrane may be a potential candidate as a novel heat-generating substrate for localized hyperthermia cancer therapy. The present study investigated the efficacy of catalytic materials, i.e., tourmaline, zinc and aluminum, in mitigating calcium carbonate scaling of carbon steel material. Artificial hard water (480 ± 20 mg/l) was used to re-circulate in the system loop for 3 days of fouling test. Tests were carried out at various solution temperatures (27, 40, and 70 °C) and flow rates (800, 1200, and 1600 ml/min). Different measurements and characterization methods were carried out. The results showed consistently lower deposition of scales when the catalytic materials were incorporated in the system (i.e., treatment case), with as much as 21% reduction compared to the no-treatment case, depending on the solution temperature and flow rate. There was more corrosion activity observed in the no-treatment case compared to the treatment case. Furthermore, the scales at the no-treatment case showed pointed, sea-urchin-like structure, while those of the treatment case were dull, star-like structures and with thicker crystals than those at no-treatment case. In this study, we have shown the potential of catalytic materials in reducing scaling formation on non-heated carbon steel surface. Amarjargal, A., Tijing, L.D., Ruelo, M.T.G., Lee, D.H. & Kim, C.S. 2012, 'Facile synthesis and immobilization of Ag–TiO 2 nanoparticles on electrospun PU nanofibers by polyol technique and simple immersion', Materials Chemistry and Physics, vol. 135, no. 2, pp. 277-281. Park, C., Kim, T., Lee, D., Tijing, L.D., Yu, M., Moon, S. & Kim, C.S. 2012, 'Magnetic Polishing of Titanium-Nickel Alloy Stents: Surface Characterization and Catheter Deployment Test', Metallurgical and Materials Transactions A, vol. 43, no. 9, pp. 3006-3010. Tijing, L.D., Ruelo, M.T.G., Amarjargal, A., Pant, H.R., Park, C. & Kim, C.S. 2012, 'One-step fabrication of antibacterial (silver nanoparticles/poly (ethylene oxide))–Polyurethane bicomponent hybrid nanofibrous mat by dual-spinneret electrospinning', Materials Chemistry and Physics, vol. 134, no. 2, pp. 557-561. We report here for the first time the use of magnetic polishing to improve the surface finish of titanium-nickel (TiNi) stents for better performance. We investigated the effects of polishing time and rotational speed on the average surface roughness, surface chemical contents, and push-out load of stents. The magnetically polished stents show a decrease of 2.3 to 17.9 pct in surface roughness and a lower push-out load for stent deployment from the catheter. A simple polyol process is presented here to synthesize silver (Ag) nanoparticles (NPs) on titanium nanosphere substrate (Ag–TiO2), which are subsequently decorated on the surface of electrospun polyurethane (PU) nanofibers by immersion in hot colloidal solution. Various spectroscopic and physical characterization techniques are utilized to study the physico-chemical properties of the prepared samples. The polyol-synthesized Ag–TiO2 decorated PU nanofibers show superior antibacterial properties under UV light, and are potentially useful for water filtration application. This paper describes a one-step fabrication of tourmaline (TM) nanoparticles (NPs)-decorated polyurethane (PU) composite nanofibers with superhydrophilic and antibacterial properties. The physico-chemical properties of the prepared samples were characterized by different characterization techniques. FESEM and TEM images confirmed the presence of well-dispersed TM NPs in/on PU nanofibers. The incorporation and homogeneous dispersion of 3 wt% TM NPs in PU exhibited an increase in tensile strength and modulus of 75% and 87%, respectively from those of the neat PU. All TM/PU composite mats showed improved hydrophilicity compared to neat PU mat, and a superhydrophilic surface with a contact angle of 13° was obtained at 5 wt% TM content. FTIR spectra confirmed the interaction of TM NPs to PU matrix through hydrogen bonding. Bacterial tests showed high zone inhibition for both Escherichia coli (Gram-negative) and Enterococci (Gram-positive) using the TM/PU composite mats with increasing efficiency as with the increase of TM NP content. The present TM/PU composite mat, which has improved mechanical properties, superhydrophilic surface, and good antibacterial properties, may be a potential candidate as an antibacterial material, in the field of health-protection textile and water filtration. The present study conducted an investigation on the effect of high-frequency electric fields (HFEF) in calcium carbonate (CaCO3) scale formation on heated copper tube surfaces. Artificial hard water at varying CaCO3 hardness was used. Calcium carbonate scales were formed on a heated copper tube surface, the fouling thermal resistance was calculated, and the calcium content of the deposited CaCO3 scale was measured by an inductively coupled plasma mass spectroscopy (ICP-MS), and the cooling water was analyzed during the scaling process. No-treatment and HFEF-treatment cases were conducted and compared. The calcium content of the deposited scale dropped by 4–49% in HFEF-treatment case. The lower calcium content of the deposit corresponded to thinner deposits. Water analyses showed consistently lesser percentage drop in HFEF-treatment case primarily due to less fouling deposition. The asymptotic fouling thermal resistance in HFEF-treatment case had a maximum decrease of 88% (i.e., from 4.5 × 10 4 to 5.4 × 10 5 m2K/W). This article describes a preliminary investigation and prototype fabrication of a novel potential sensing method to continuously monitor vascular stent fractures. A potential measurement system consisting of Wheatstone bridge circuit and signal conditioning circuit was designed for the cardiovascular stent durability and fatigue test. Each end of a bare and polyurethane-covered Nitinol vascular stent was electrically connected to the potential measurement system and then immersed either in simulated body fluid (SBF) media or distilled water at 36.4 ± 1 °C. When the stent experienced fracture (i.e., a cut), its electrical potential decreased with an increase in electrical resistance. This method successfully measured fractures in the stent regardless of location. Furthermore, the number of cycles at the onset of stent fracture was accurately detected and continuously monitored using this technique. Thus, the present fracture detection method, which to our knowledge is the first ever report to use electrical potential measurement for stent durability test, gives a fast, real-time, accurate and efficient detection of fractures in stent during in vitro fatigue and durability test. Tijing, LD, Kim, HY, Lee, DH, Kim, CS & Cho, YI 2010, 'Physical water treatment using RF electric fields for the mitigation of CaCO 3 fouling in cooling water', International Journal of Heat and Mass Transfer, vol. 53, no. 7, pp. 1426-1437. Tijing, LD, Kim, HY, Lee, DH, Kim, CS & Cho, YI 2009, 'Use of an oscillating electric field to mitigate mineral fouling in a heat exchanger', Experimental Heat Transfer, vol. 22, no. 4, pp. 257-270. Tijing, LD, Pak, BC, Lee, DH & Cho, YI 2008, 'Heat-treated titanium balls for the mitigation of mineral fouling in heat exchangers', Experimental Heat Transfer, vol. 21, no. 2, pp. 115-132. Tijing, LD, Pak, BC, Baek, BJ, Lee, DH & Cho, YI 2007, 'An experimental study on the bulk precipitation mechanism of physical water treatment for the mitigation of mineral fouling', International communications in heat and mass transfer, vol. 34, no. 6, pp. 673-681. Tijing, LD, Pak, BC, Baek, BJ & Lee, DH 2006, 'A study on heat transfer enhancement using straight and twisted internal fin inserts', International Communications in Heat and Mass Transfer, vol. 33, no. 6, pp. 719-726. Lee, GJ, Tijing, LD, Pak, BC, Baek, BJ & Cho, YI 2006, 'Use of catalytic materials for the mitigation of mineral fouling', International communications in heat and mass transfer, vol. 33, no. 1, pp. 14-23. Jung, MY, Kim, CS, Tijing, LD, Pak, BC & Cho, YI 2006, 'A study of the onset of biofouling using quartz crystal nanobalance', International communications in heat and mass transfer, vol. 33, no. 1, pp. 7-13. Efficient Desalination by Reverse Osmosis provides a complete guide to best practice from pre-treatment through to project delivery. It is written for utility managers & professionals. The worldwide problem on water scarcity has led to innovations in desalination technologies. The main desalination technologies used nowadays are multi-stage flash distillation and reverse osmosis; however both require large amounts of energy for pure water production. Scarcities in energy and water are considered as two of the top challenges in the world, thus there is a necessity to provide desalination technologies that can address both of these issues. Membrane distillation (MD) is gaining momentum as a potential alternative for water purification and desalination because it can possibly utilize low grade/waste heat, and solar energy with very high recovery (100% theoretical). MD is a thermally-driven membrane separation process utilizing low operating temperature (below 90oC) that allows only water vapor to pass through a hydrophobic, porous membrane, and is operated at ambient pressure or at vacuum pressure. MD is driven by the difference in partial vapor pressure between the hot feed and cold permeate streams. Woo, Y, Tijing, LD, Yao, M & Shon, HK 2015, 'Nanofiber Membranes for Membrane Distillation: Potential and Performance', 8th International Conference on Materials for Advanced Technologies of the Materials Research Society of Singapore & 16th IUMRS - International Conference in Asia together with 4th Photonics Global Conference 2015, Singapore. The worldwide problem on water scarcity has led to innovations in desalination technologies. The main desalination technologies used nowadays are multi-stage flash distillation and reverse osmosis; however both require large amounts of energy for pure water production. Scarcities in energy and water are considered as two of the top challenges in the world, thus there is a necessity to provide desalination technologies that can address both of these issues. Membrane distillation (MD) is gaining momentum as a potential alternative for water purification and desalination because it can possibly utilize low grade/waste heat, and solar energy with very high recovery (100% theoretical). MD is a thermally-driven membrane separation process utilizing low operating temperature (below 90oC) that allows only water vapour to pass through a hydrophobic, porous membrane, and is operated at ambient pressure or at vacuum pressure. MD is driven by the difference in partial vapor pressure between the hot feed and cold permeate streams. A good MD membrane should have adequate hydrophobicity or preferably superhydrophobicity, high porosity and low tortuosity, a small mean pore size and narrow pore size distribution (PSD), and adequate mechanical and chemical stability. A number of techniques are used to modify the surface to improve the hydrophobicity of a membrane such as layer-by-layer assembly, plasma treatment, lithography, and coating/incorporation of hydrophobic materials/nanoparticles. However, most of these methods require several processes and special equipment. Hence, finding a fabrication method that is easy and could be possibly scaled-up to produce hydrophobic/superhydrophobic membranes with adequate properties would be a welcome development in the membrane technology for MD. Woo, Y, Tijing, LD & Shon, HK 2014, 'Hydrophobic/hydrophilic dual-layer electrospun nanofibrous membranes for air gap membrane distilltation', 4th IWA Regional Conference on Membrane Technology 2014, IWA Regional Conference on Membrane Technology, Vietnam. In the present study, we fabricated and optimized a multi-component nanofiber membrane produced by simple electrospinning and investigated its performance for desalination by air gap membrane distillation (AGMD). Neat and composite two-layer nanofiber membranes composed of polyvinyidene fluoride (PVDF), PVDF/nylon-6 or PVDF/polyacrylonitrile (PAN) were fabricated with and without heat-press post-treatment at 170 C. Different characterization and measurement techniques such as contact angle and liquid entry pressure (LEP) measurements, scanning electron miscroscopy and AGMD tests were used to characterize the resultant electrospun nanofiber membranes (ENMs) and its desalination performance. Surface characterization showed that all ENMs exhibit a rough and superhydrophobic surface (>142 ° water contact angle). Heat-pressing the membrane resulted to thinner thickness (<25 µm thickness) and smaller pore sizes. The AGMD experiments in a cross-flow set up were carried out with constant inlet temperatures at the feed and permeate sides of 60±1.5 and 20±1.5 C, respectively. The feed and permeate velocity were both maintained at 2.4×10-3 m/s. The AGMD module had a membrane area of 21 cm2 and the thickness of the air gap was 3 mm. The ENMs were able to present a water permeate flux of about 19-21 LMH using de-ionized water as feed, which was much higher than that of a commercial PVDF membrane (~14 LMH). The current superhydrophobic and highly porous membranes showed good potential for AGMD application. Tijing, LD, Pak, BC, Baek, BJ, Lee, DH & Cho, YI 2007, 'USING LOW-VOLTAGE-HIGH-FREQUENCY ELECTRIC FIELD TO MITIGATE MINERAL FOULING IN A HEAT EXCHANGER', , pp. 1683-1688. Tijing, LD, Pak, BC, Baek, BJ & Lee, D 2006, 'A study of new anti-fouling technology using the catalytic properties of titanium in mineral fouling mitigation', International Heat Transfer Conference 13, Begel House Inc..
Tijing, LD, Pak, BC, Baek, BJ & Lee, DH 2006, 'An experimental study on the flocculation mechanism of physical water treatment for the mitigation of mineral fouling', , pp. 128-133.